"So writing books on specific geek/fan/otaku careers and cultural issues sounded like a great idea. But where to start? I started with cosplay since I knew the least about it. I guess it worked out as I got one huge book out of all the interviews that went into it . . ."
Are you a cosplayer, costumer, or both? Do you think about turning your interest into a career - or are looking to see how your hobbies can enhance your career? This book is for those of you with a love of crafting outfits, dressing in them, or both. Containing over fifty different tips, suggestion and must-do guides, it will help you see your hobby with an eye towards making a new career or enhancing a current one. Created from an extensive series of interviews and research, "Focused Fandom: Cosplay, Costuming, and Careers" is a guide for you and everyone you know to create a career out of your passion for making and wearing costumes, garb, and more! 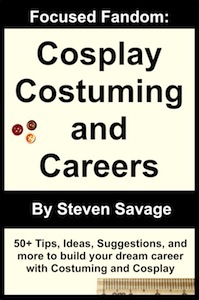 Easy organization - Three major sections help you focus on the advantages, career options, and career must-dos for people interested in cosplay and costuming. Over 50 specific tips, ideas, and suggestions - Zoom in on what's going to help you the most! Exercises, challenges, and next steps - Helpful ways to get your mind moving so you can put what you learn into practice. Quotes from cosplayers and costumers - Get unique, personal insights from a variety of people just like you!